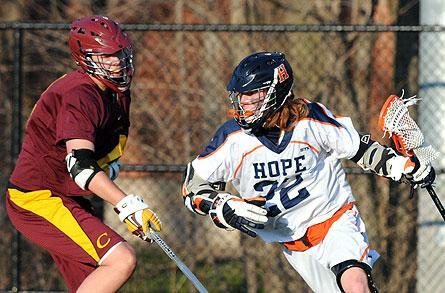 The Hope College men’s lacrosse team has finished fourth in the preseason Michigan Intercollegiate Athletic Association coaches poll. Coach Michael Schanhals’ Flying Dutchmen received 21 points for fourth place in the seven-team poll. Reigning MIAA champion Adrian College topped the poll with six points and all possible six first-place votes. Hope is coming off its first varsity season. In 2012, the Flying Dutchmen placed fourth in the MIAA regular-season standings and qualified for the league tournament. They lost to Adrian in the tournament semifinals. Hope starts the season on Friday, March 7, when it plays at Denison. The home opener for the Flying Dutchmen is Wednesday, March 12, when it hosts Calvin at Van Andel Stadium. Hope College women’s basketball player Megan Kelley has earned Capital One NCAA Division III Academic All-District® Honors from the College Sports Information Directors of America. In honor of 2014 National Girls and Women In Sports Day, Hope College Athletics invites West Michigan-area middle school girls to attend a special evening of events to celebrate the achievements of girls and women in sports.